← Curiosity making tracks…with morse code? 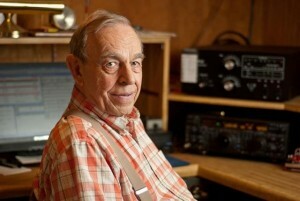 I’m very proud of our local free community newspaper, the Mountain Xpress for its article on ham radio. Not only does the article give readership a short primer in the hobby, but it also profiles a variety of local hams–even an 18 year old YL. On a stifling late-June day, a tangle of wires snakes through the open door of the Buncombe County Firefighters’ Training Center. Outside, the sun beats down and the roar of big generators fills the air; indoors, the atmosphere is even thicker, dense with a jarring concoction of radio static, Morse code and urgent voices. […]At first glance, the whole endeavor seems anachronistic. In an age of global communication, pervasive cell coverage and hundred-million-member social networks, what’s the attraction of basic, point-to-point radio communication? Who are these people who call each other not by name but by arcane strings of characters? What exactly are they doing? […]That fear may be unfounded: Today’s ubiquitous tech appears to be re-energizing the long-standing hobby. Pioneering operators have merged radio (an analog medium) with digital communication, and the Internet gives beginners a broad base of support. Nationwide, there are 700,000 licensed hams — an all-time high, he reports. The licensing process is easy, Morine maintains, and ham radio’s staid image is no longer accurate. […]Carl Smith (N4AA) represents the old guard. Licensed in 1954 at age 14, the Air Force veteran and retired electronics salesman has logged more than 70,000 radio contacts, many from his home in Leicester. In ham circles, he’s a big deal: For the past 15 years, he’s published The DX Magazine, a bimonthly journal for serious hams with long-range ambitions. […]For some operators, service is ham radio’s primary purpose, and dropping the code requirement has unquestionably attracted many younger licensees. Eighteen-year-old Virginia Todd (KK4BRE), for example, got involved due to radio’s community-service opportunities and usefulness in emergencies. Paul Tilley (KK4BRD) says ham radio is just another communications tool he uses as a SKYWARN spotter. In foul weather, Tilley takes to the road in a truck equipped with a rooftop weather station, using his radio to report conditions to the National Weather Service. In remote areas lacking cell coverage, Tilley’s radio has enabled him to give people in the path of a storm time to prepare. Even the most obsessed hams make time for community-service work. When Smith isn’t chasing DX, he heads the Buncombe County Amateur Radio Emergency Service, whose roughly 25 volunteers assist emergency-response agencies when normal communications fail. Because radio requires no infrastructure, it’s often vital in large-scale emergencies. […]That’s why emergency power is paramount on Field Day. But though the underlying purpose is serious, the event is also a chance for these operators to have some fun. Watching Smith work CW is a jaw-dropping experience, and he quickly draws a crowd. Even while talking to those around him, he transmits so fast that the individual dits and dahs are barely discernible. Outside, other hams set up antennas in preparation for an all-nighter. “This is my favorite day of the year,” says Tonya Campbell (WB0VDK) in between transmissions. And as night falls, Marc Huennekens (KG4OPM) sets up a station in a tent in the bed of his truck. Using an old, tube-driven radio, he plans to log as many contacts as he can before falling asleep. Back in the training center, the room is thick with Smith’s rapid-fire code, open-band static and low voices swapping stories. One old-timer recalls how it feels to be hit by lightning — twice. After 24 grueling hours, the club has logged nearly 1,000 contacts. Smith alone worked 300 stations, transmitting all night and into the next morning. The allure of ham radio, he explains, is equal parts technical endeavor, community service and fellowship. Read the full article in the Mountain Xpress online. This entry was posted in Articles, CW, Events, Field Day. Bookmark the permalink. I hope we could have the same in France, not dreaming about Viêt-Nam. Even the recent launch of F-1 cubesat did not draw that much attention toward the hobby.